In summer he is seen in tailored white and blue shirts, perfectly rolled up sleeves and well-fitted pants, and in winter in sharp suits and scarves. Germany’s World Cup winning coach Joachim Low is easily the best dressed man on the football field anywhere in the world, now that David Beckham is usually seen sitting in the stands. So it is not really surprising that German luxury fashion house Hugo Boss is the official fashion outfitter to the national squad. And it is not surprising either that in this picture sent to us by Hugo Boss, the remarkably fit 54- year old Low is clearly the centre of all attention in his dark blue three-piece suit, polka dot tie and pocket square, all from Boss Made To Measure collection. 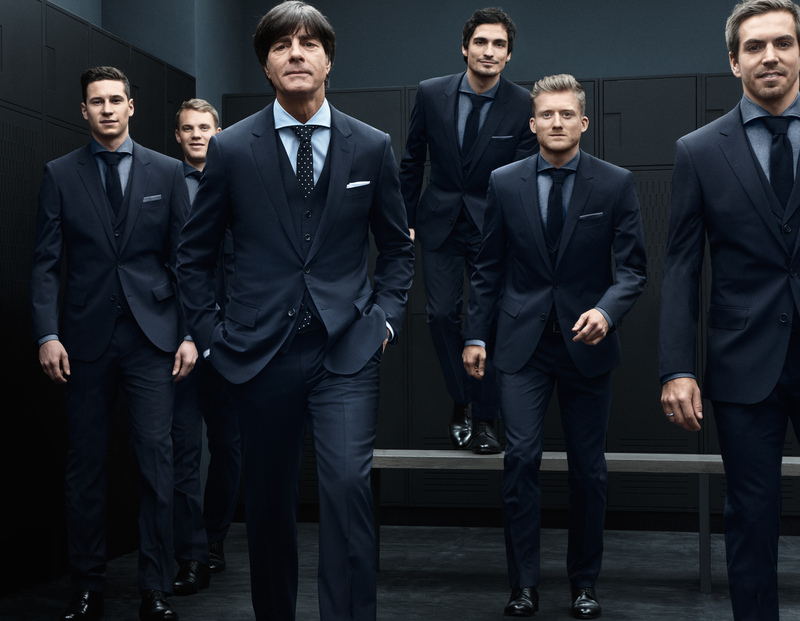 The players (from left) Julian Draxler, Manuel Neuer, Mats Hummels, Andre Schurrle and Philipp Lahm in their sleekly cut three-piece suit never looked better. They obviously picked up some style lessons from their coach, whose on field assistants are also usually colour and style coordinated with him.